The Mormon pioneers were members of The Church of Jesus Christ of Latter-day Saints (LDS Church), also known as Latter-day Saints, who migrated across the United States from the Midwest to the Salt Lake Valley in what is today the U.S. state of Utah. 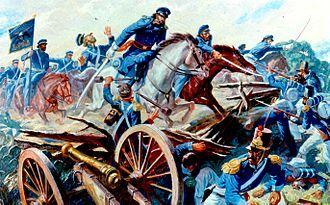 At the time of the ceasefire and planning of the exodus in 1846, the territory was owned by the Republic of Mexico, which soon after went to war with the United States over the annexation of Texas. Salt Lake Valley became American territory as a result of this war. The journey was taken by about 70,000 people beginning with advance parties sent out by church leaders in March 1846 after the 1844 assassination of the Mormon leader Joseph Smith made it clear the group could not remain in Nauvoo, Illinois—which the church had recently purchased, improved, renamed, and developed because of the Missouri Mormon War, setting off the Illinois Mormon War. 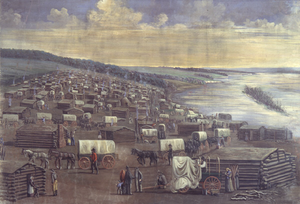 The well-organized wagon train migration began in earnest in April 1847, and the period (including the flight from Missouri in 1838 to Nauvoo), known as the Mormon Exodus is, by convention among social scientists, traditionally assumed to have ended with the completion of the First Transcontinental Railroad in 1869. Not everyone could afford to transport a family by railroad, and the transcontinental railroad network only serviced limited main routes, so wagon train migrations to the far west continued sporadically until the 20th century. Map showing the westward exodus of the LDS Church between 1846 and 1869. Also shown are a portion of the route followed by the Mormon Battalion and the path followed by the handcart companies to the Mormon Trail. 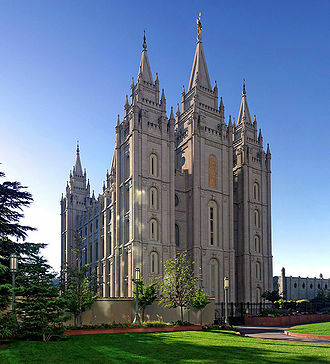 Since its founding in 1830, members of the LDS Church were often harshly treated by their neighbors, partially due to their religious beliefs, sometimes as a reaction against the actions and the words of the LDS Church and its members and leaders. These and other reasons caused the body of the Church to move from one place to another—to Ohio, Missouri, and then to Illinois, where church members built the city of Nauvoo. Sidney Rigdon was the First Counselor in the LDS First Presidency, and as its spokesman, Rigdon preached several controversial sermons in Missouri, including the Salt Sermon and the July 4th Oration. These speeches have sometimes been seen as contributing to the conflict known as the 1838 Mormon War in Missouri. As a result of the conflict, the Mormons were expelled from the state by Governor Boggs, and Rigdon and Smith were arrested and imprisoned in Liberty Jail. Rigdon was released on a writ of habeas corpus and made his way to Illinois, where he joined the main body of Mormon refugees in 1839. In 1844 Joseph Smith, and his brother Hyrum Smith were killed by a mob while in custody in the city of Carthage, Illinois. 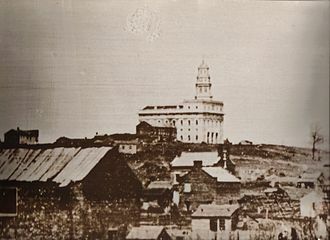 In 1846, religious tensions reached their peak, and in 1848 mobs burned the Latter-day Saint temple in Nauvoo. According to church belief, God inspired Brigham Young, Joseph Smith's successor as President of the Church, to call for the Saints (as church members call themselves) to organize and head West, beyond the western frontier of the United States (into what was then Mexico, though the U.S. Army had already captured New Mexico and California in late 1846). 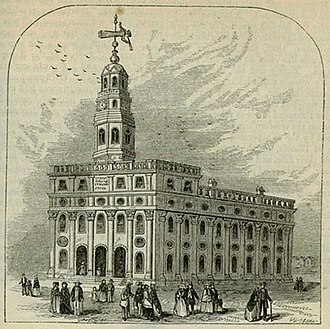 During the winter of 1846–47, Latter-day Saint leaders in Winter Quarters and Iowa laid plans for the migration of the large number of Saints, their equipment, and their livestock. It was here that Brigham Young first met Thomas L. Kane, a non-Mormon from Philadelphia with deep personal connections to the Polk administration. Kane obtained permission for the Mormons to winter on Indian territory, and the site was originally called Kanesville. Brigham Young continued to trust Kane throughout his own lifetime, particularly as an intermediary with the often hostile Federal government. This major undertaking was a significant test of leadership capability and the existing administrative network of the recently restructured Church. For his role in the migration, Brigham Young is sometimes referred to as the "American Moses." Brigham Young personally reviewed all available information on the Salt Lake Valley and the Great Basin, consulting with mountain men and trappers who traveled through Winter Quarters, and meeting with Father Pierre-Jean De Smet, a Jesuit missionary familiar with the Great Basin. The wary Young insisted the Mormons should settle in a location no one else wanted, and felt the Salt Lake Valley met that requirement but would provide the Saints with many advantages as well. 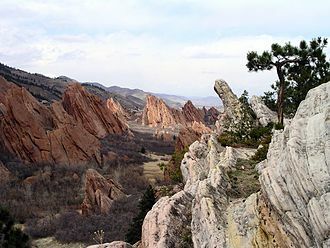 Brigham Young organized a vanguard company to break the trail west to the Rocky Mountains, gather information about trail conditions, including water sources and native tribes, and to ultimately select the central gathering point in the Great Basin. The initial company would select and break the primary trail with the expectation that later pioneers would maintain and improve it. It was hoped that the group could, wherever possible, establish fords and ferries and plant crops for later harvest. In late February, plans were made to gather portable boats, maps, scientific instruments, farm implements and seeds. Techniques for irrigating crops were investigated. A new route on the north side of the Platte River was chosen to avoid major interaction with travelers using the established Oregon Trail on the river's south side. Given the needs of the large volume of Saints who would travel west, Church leaders decided to avoid potential conflicts over grazing rights, water access and campsites. In April 1847, Young consulted with members of the Quorum of the Twelve Apostles who had recently returned from the British mission. John Taylor, Parley P. Pratt and Orson Hyde brought money contributed by the English Saints, a map based on John C. Fremont's recent western expedition, and instruments for calculating latitude, elevation, temperature and barometric pressure. Chosen members of the vanguard group were gathered together, final supplies were packed, and the group was organized into military companies. The group consisted of 143 men, including three blacks and eight members of the Quorum of the Twelve Apostles, three women, and two children. The train contained 73 wagons, one cannon, 93 horses, 52 mules, 66 oxen, 19 cows, 17 dogs and some chickens, and carried enough supplies to fully provision the group for one year. Young divided this group into 14 companies, each with a designated captain. Apprehensive of possible Indian danger, a militia and night guard was formed under the direction of Stephen Markham. On April 5, 1847, at 2 p.m., the wagon train moved west from Winter Quarters toward the Great Basin. With the afternoon start, they made three miles (5 km) and camped in a line a few hundred yards from a stand of timber. Journal records show that Young actively managed the journey, supervising details and occasionally giving reprimands when evening and Sunday recreation became rowdy or group members failed to complete their tasks. On one occasion, he chastised the camp's hunters for being wasteful of flesh ... killing more than was really needed. Camp was awakened by a bugle at 5 a.m. and the company was expected to be prepared for travel by 7 a.m.. Each day's travel ended at 8:30 p.m. and the camp was in bed by 9 p.m.. The company traveled six days during the week, but generally stayed in camp on Sunday to observe the Sabbath. Some camp members were assigned specific tasks. William Clayton was appointed company scribe and was expected to record an accurate description of their journey and the distance they traveled each day. After three weeks, Clayton grew tired of personally counting the revolutions of a wagon wheel and computing the day's distance by multiplying the count by the wheel's circumference. After consulting with Orson Pratt, an accomplished mathematician, he designed a mechanism consisting of a set of wooden cog wheels attached to the hub of a wagon wheel, with the mechanism "counting" or recording by position the revolutions of the wheel. Clayton's design, which he called the roadometer, is the basis for most modern odometers. The apparatus was built to Clayton and Pratt's specifications by the company's carpenter Appleton Milo Harmon and was first used on the morning of May 12, 1847. The roadometer showed that the company averaged between fourteen and twenty miles per day. Apostle Orson Pratt was named the company's scientific observer. 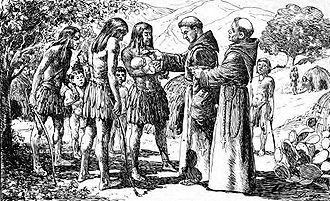 He made regular readings on scientific instruments, took notes on geological formations and mineral resources, and described plants and animals. Journals kept by both Clayton and Pratt have become valuable resources for historians of the Mormon trek west. Women of the company also performed vital tasks along the way. 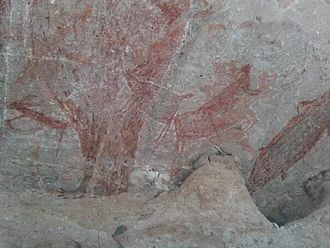 While much time was spent on traditional activities such as cooking, sewing, and tending children, several women served as scribes and diary keepers. Harriet Page Young, wife of Lorenzo Young, was the first woman selected for the company. She was in ill health and Lorenzo Young feared to leave her and their young children behind. The other original women of the company, Ellen Sanders Kimball, wife of Heber C. Kimball, and Clarissa Decker Young, wife of Brigham Young, were asked to accompany the group to look after Harriet Young and keep her company. The three women were joined by a larger group of women church members from Mississippi who merged with the main party at Laramie, Wyoming. 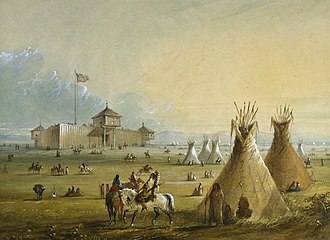 The first segment of the journey, from Winter Quarters to Fort Laramie took six weeks, with the company arriving at the fort on June 1. The company halted for repairs and to reshoe the draft animals. While at Fort Laramie, the vanguard company was joined by members of the Mormon Battalion who had been excused from service due to illness and sent to winter in Pueblo, Colorado. Also traveling in the new group were Church members from Mississippi who had taken a more southern route toward the Great Basin. At this point, the now larger company took the established Oregon Trail toward the trading post at Ft. Bridger. 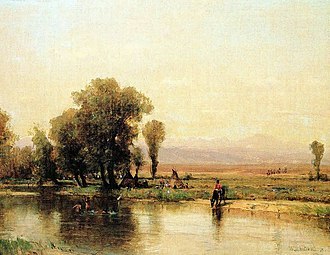 At a difficult crossing of the Platte, just before encountering the Sweetwater River, the company made use of their portable boat and were able to cross with comparative ease. Seizing the opportunity to both help future travelers and increase the cash available to the migration, nine men under the direction of Thomas Grover were left behind to construct and operate a ferry at that location. 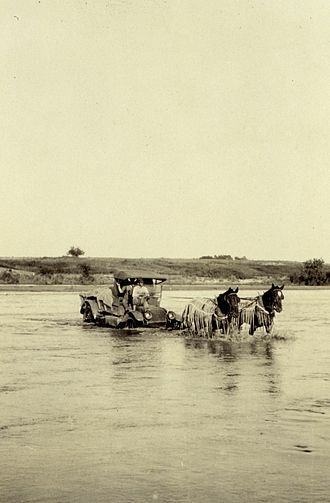 Missourians and other travellers at the river paid the Saints $1.50 or more per wagon to help them cross. During the last week of June, Sam Brannan, leader of the Mormon emigrant ship Brooklyn, met the company near Green River, Wyoming. He reported to Young about his group's successful journey and their settlement in what is today San Francisco, California. 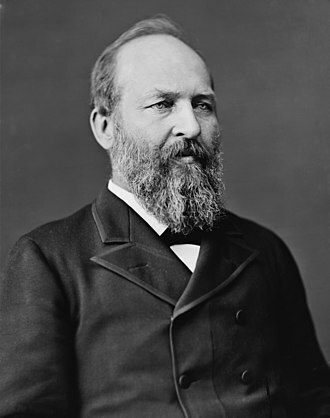 He urged the vanguard company to continue on to California but was unable to shift the leader's focus away from the Great Basin. 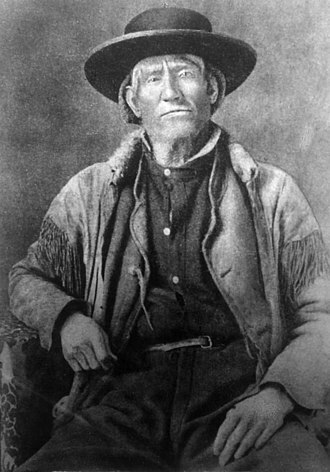 Young also met mountain man Jim Bridger on June 28. 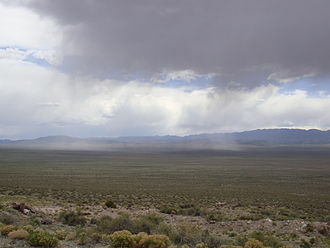 They discussed possible routes into the Salt Lake Valley, and the feasibility of viable settlements in the mountain valleys of the Great Basin. Bridger was enthusiastic about settlement near Utah Lake, reporting fish, wild fruit, timber and good grazing. He told Young that local Indians raised good crops, including corn and pumpkins, but that there was ever-present danger of frost. The company pushed on through South Pass, rafted across the Green River and arrived at Fort Bridger on July 7. About the same time, they were joined by thirteen more members of the sick detachment of the Mormon Battalion. The vanguard company now faced a more rugged and hazardous journey, and were concerned about negotiating the passes of the Rocky Mountains. 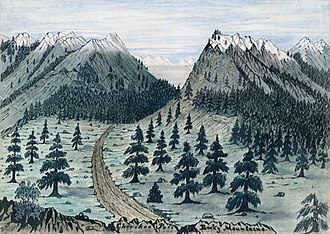 They had received conflicting advice, but Young chose to follow the trail used by the Donner-Reed party on their journey to California the previous year. Shortly after leaving Fort Bridger, the group met trapper Miles Goodyear, who owned a trading post at the mouth of the Weber River. He was enthusiastic about the agricultural potential of the large Weber Valley. During the trip through the rugged mountains, the vanguard company divided into three sections. Since crossing the Green River, several members of the party had suffered from a fever, generally accepted as a "mountain fever" probably induced by wood ticks. Young himself became ill soon after meeting Goodyear. The small sick detachment lagged behind the larger group, and a scouting division was created to move ahead on the designated route. In July 1847 the first company reached the Salt Lake Valley, with scouts Erastus Snow and Orson Pratt entering the valley on July 21. Pratt wrote: ...we could not refrain from a shout of joy, which almost involuntarily escaped from our lips the moment this grand and lovely scenery was within our view. 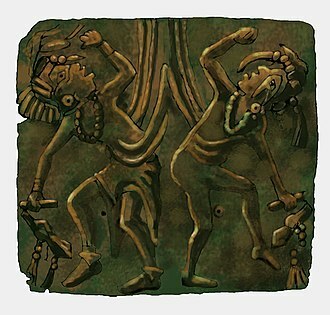 The two scouts undertook a twelve-mile (19 km) exploratory circuit into the valley before returning to the larger party. The next day, larger segments of the valley were explored, streams and hot springs investigated and the first camp established in the Salt Lake Valley. On July 23, Pratt offered a prayer dedicating the land to the Lord. Ground was broken, irrigation ditches were dug, and the first fields of potatoes and turnips were planted. On July 24, Young first saw the valley from a "sick" wagon driven by his friend Wilford Woodruff. According to Woodruff, Young expressed his satisfaction in the appearance of the valley and declared "This is the right place, drive on." Today a monument stands in the spot where he made this declaration. Young later reported that he had seen the valley, including Ensign Peak, in a vision and recognized the spot. On July 28, Young established a location for the future Salt Lake Temple and presented a city plan to the larger group for their approval. In August 1847, Young and other selected members of the vanguard company returned to Winter Quarters. By December 1847, more than two thousand Mormons had completed the journey to the Salt Lake Valley. Several hundred, including Young, returned east to gather and organize the companies scheduled for following years. Demographic estimates place 1,611 pioneers in the valley of the Great Salt Lake during the winter of 1847. The adult labor force, however, was quite small as a high percentage of the group, 53.2 percent were under the age of nineteen. Twenty five percent of the total were children under the age of eight. Each year during the Mormon migration, people continued to be organized into "companies", each company bearing the name of its leader. The company was further divided into groups of 10 and 50 with authority and responsibility delegated downward. The pioneers traveled to the Salt Lake Valley in the Great Basin using mainly large farm wagons, handcarts, and, in some cases, personally carrying their belongings. [notes 1] Their trail along the north bank of the Platte River and North Platte River and over the continental divide climbing up to South Pass and Pacific Springs from Fort John along the valley of the Sweetwater River and then down to Fort Bridger and thence down to the Great Salt Lake became known as the Mormon Trail. Financial resources of the Church members varied, with many families suffering from the loss of land and personal possessions in Missouri and Illinois. This impacted the resources and supplies each family could draw upon as they covered the more than 1,000 miles (2,000 km) to the Great Basin. Church funds were also limited at this time, but church leaders provided what funding and other material assistance they could to families and companies which were under supplied. Covered wagons pulled by oxen were common, particularly in the early American companies. In October 1845, as LDS members were preparing to leave Nauvoo, the Nauvoo Neighbor printed an extensive list of suggested provisions for each family wagon. The provisions included two to three yoke of oxen, two milk cows, other livestock, arms and ammunition, 15 lb of iron, pulleys and ropes, fishing gear, farming and mechanical equipment, cooking equipment and at least 1000 pounds of flour plus assorted other foodstuffs. Some pioneers overestimated the amount of goods they could haul on the long journey. As the oxen weakened under the strain, wagons were lightened by discarding prized possessions, including book collections, family china and furniture. In 1847, just east of the Rocky Mountains, the Kimball family dug a large hole, wrapped their piano in buffalo skins and carefully buried it. An ox team retrieved the instrument the following spring and transported it to the Salt Lake Valley. Several later companies were largely made up of people with fewer resources, who pulled or pushed handcarts (similar to wheelbarrows) holding all of their provisions and personal belongings. Many of these pioneers walked much of the way as family members rode in the carts. Due to the weather in the American heartland, the best time to travel was April–September. Some companies, however, started late in the season which resulted in hardship and sometimes disaster. The most famous of these are the Willie and the Martin handcart companies. Leaving Iowa in July 1856, they did not reach Utah until November, suffering many deaths due to winter weather and the lack of adequate supplies. In November 1845 Samuel Brannan, newspaperman and small-scale publisher of the Mormon paper The Prophet (later the New York Messenger), was directed by church elders to charter a ship that would carry its passengers away from the eastern United States to California, which was then part of Mexico. Over the course of two months, Brannan managed to recruit 70 men, 68 women, and 100 children—238 persons total. Brannan negotiated a fare of $75 for adults and half-fare for children with the Captain Abel W. Richardson, master and a principal owner of the ship Brooklyn. On the 4th of February, 1846 (the same day the Mormon Nauvoo exodus began), the ship Brooklyn cleared New York harbor and began its nearly 6-month voyage to the Pacific coast of the then-Mexican Territory of California. The ship weighed 445 short tons (404 t) and measured 125 ft x 28 ft × 14 ft (8.5 m × 4.3 m) x 4.3 m) and was built in 1834 by Joseph H. Russell at Newcastle, Maine. The voyage is the longest passage made by a Mormon emigrant company. The ship Brooklyn sailed from Brooklyn Harbor, New York, and traveled south across the Atlantic equator, around Cape Horn, stopping at the Juan Fernández Islands, then to the Sandwich Islands (Hawaii), finally docking in Yerba Buena (San Francisco) on July 29, 1846, having made the sea voyage in five months and twenty-seven days. As for the pleasure of the trip, we met disappointment, for we once lay becalmed in the tropics, and at another time we were "hatched below" during a terrific storm. Women and children were at night lashed to their berths, for in no other way could they keep in. Furniture rolled back and forth endangering limb and life. The waves swept the deck and even reached the staterooms... Children's voices were crying in the darkness, mother's voices soothing or scolding, men's voices rising above the others, all mingled with the distressing groans and cries of the sick for help, and, above all, the roaring of the wind and howling of the tempest made a scene and feeling indescribable. On the announcement of the United States naval officer, who boarded the Brooklyn as she came to anchor, that the emigrants "were in the United States of America," three hearty cheers were given in reply... Three weeks previous to the arrival of the Saints, the United States flag had been raised and the country taken possession of in the name of the government which the flag represented. This dangerous trek of nearly 24,000 miles (39,000 km) would claim 10 lives of the ship's 238 passengers, nine of whom were buried at sea. 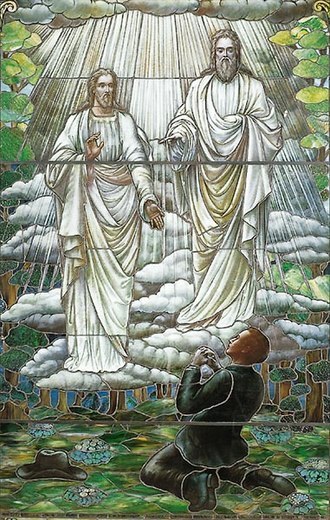 After the initial departure of the Latter-day Saints living in Illinois and Missouri, converts to the church from other areas in the United States and from Europe followed the initial trail to join the main body of the Church in Salt Lake City. Every year from 1847 until 1869, church members making this journey were formed into organized companies. Migration continued until about 1890, but those who came by railroad are not generally considered to be "Mormon pioneers." Mormon pioneers emigrated from many countries. Denmark was one of those countries, with a large number of Mormon emigrants coming to Utah between 1850 and 1910. 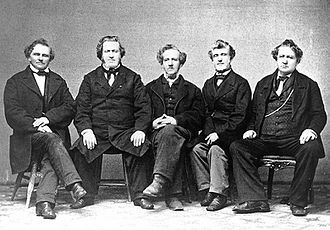 The migration of Danes was initiated when missionaries from the LDS Church, including Erastus Snow, Peter O. Hansen and two others, were sent to Denmark in 1850. Hansen made the first translation of the Book of Mormon from English, by translating it into Danish. Religious freedom was written into the constitution of the Kingdom of Denmark in 1849. 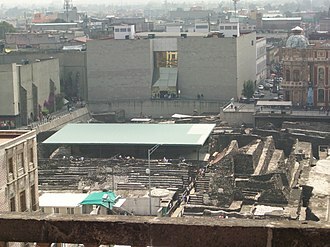 Along with the Danish translation of the Book of Mormon, this opened the area to great success in attaining converts. At that time the LDS Church was urging new members to gather to Utah, which led these early converts to make emigration plans. Box Elder, Cache, Salt Lake, Utah, and Sevier counties had large numbers of Danes listed in 19th Century Utah census totals but Sanpete County was the area where the largest number settled. The Mormons settled in the Salt Lake Valley, which at that time was used as a buffer zone between the Shoshones and the Utes, who were at war. Upon arriving in the Salt Lake Valley, the Mormons had to develop and cultivate the arid terrain to make it suitable for habitation. 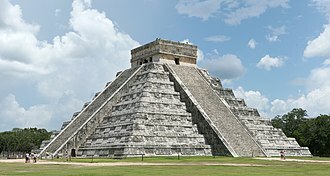 They created irrigation systems, laid out farms, built houses, churches and schools. Access to water was crucial. Almost immediately, Brigham Young sent out scouting parties to identify and claim additional community sites. 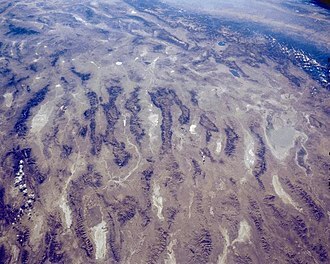 While it was difficult to find large areas in the Great Basin where water sources were dependable and growing seasons long enough to raise vitally important subsistence crops, satellite communities began to be formed in all directions. Church members eventually headed south into present day Arizona and Mexico, west into California, north into Idaho and Canada, and east into Wyoming, settling many familiar communities in those areas. Shortly after the first company arrived in the Salt Lake Valley in 1847, the community of Bountiful was settled to the north. In 1848, settlers moved into lands purchased from trapper Miles Goodyear in present-day Ogden. In 1849, Tooele and Fort Utah in modern-day Provo were founded. The settlement of Provo was particularly troubling to the Utes, since it was at the heart of their territory. Ute chief Wakara suggested the settlers instead move into the Sanpete Valley in central Utah, where the settlers established the community of Manti. Tensions in Fort Utah mounted after Mormons murdered Old Bishop, and Brigham Young ordered an attack on Utes, called the Battle at Fort Utah. 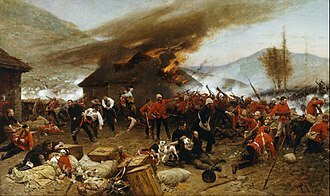 This was shortly followed by the Walker War. 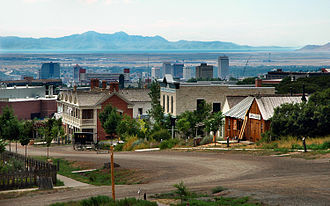 Fillmore, Utah, intended to be the capital of the new territory, was established in 1851. In 1855, missionary efforts aimed at local native cultures led to outposts in Fort Lemhi on Idaho's Salmon River, Las Vegas, Nevada and Elk Mountain in east central of present-day Utah. The experiences of returning members of the Mormon Battalion were also important in establishing new communities. On their journey west, the Mormon soldiers had identified dependable rivers and fertile river valleys in Colorado, Arizona and southern California. In addition, as the discharged men traveled to rejoin their families in the Salt Lake Valley, they moved through southern Nevada and southern Utah. Jefferson Hunt, senior Mormon officer of the Battalion, actively searched for settlement sites, minerals and other resources. 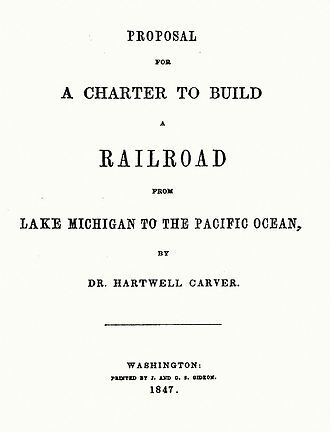 His report encouraged 1851 settlement efforts in Iron Country, near present-day Cedar City. These southern explorations eventually led to Mormon settlements in St. George, Utah, Las Vegas and San Bernardino, California, as well as communities in southern Arizona. 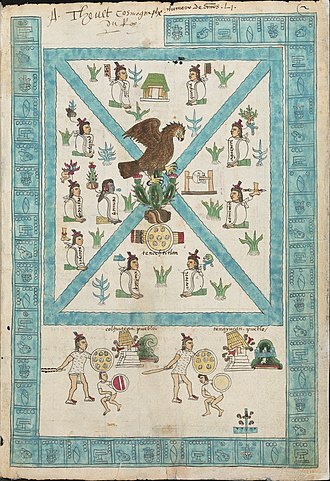 By 1885, Mormon communities were being established in northern Mexico. The Mormon pioneers are celebrated annually on July 24 in the State of Utah, known as Pioneer Day. 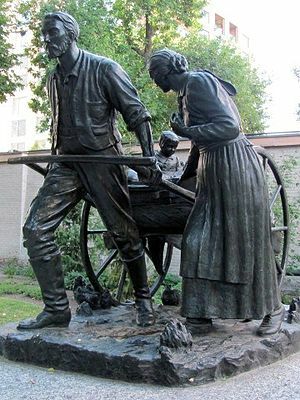 Salt Lake City also has the Mormon Pioneer Memorial Monument, where Brigham Young, Eliza R. Snow, and other Mormon pioneers are buried and where a memorial exists dedicated to all who crossed the plains to the Salt Lake Valley. Additionally, the Pioneer (characterized as "Pioneer Pete") is Lehi High School's mascot. Lehi High School is located in Lehi, Utah County. In some places, Mormons hold an event called "Pioneer Trek" for people who are ages fourteen to eighteen. In participating in the trek, the youth dress as pioneers and pack a few things to carry in handcarts. They go on a hike for a couple days so they can experience what the pioneers experienced. During this multi-day event, camp organizers sometimes require youth to avoid the use of technology or anything that the pioneers did not have on their journeys, to enhance the experience. The Mormon Pioneer Overland Travel gathers information from journals, church history records, and other materials to locate the company in which an ancestor traveled across the plains to get to Utah. This covers known and unknown wagon trains from 1847-1868. It contains lists of passengers in companies as well as genealogical information about ancestors. It is the most comprehensive list of Mormon immigrants and the wagon trains that brought them to Utah. ^ According to the American Studies researchers involved with the Oregon Trail II game, such wagons had a cargo capacity of about 3,000 pounds and weighed another thousand themselves. ^ May, Dean L. Utah: A People's History p. 57. Bonneville Books, Salt Lake City, Utah, 1987. ISBN 0-87480-284-9. ^ Slaughter, William and Landon, Michael. "Trail of Hope: The Story of the Mormon Trail". 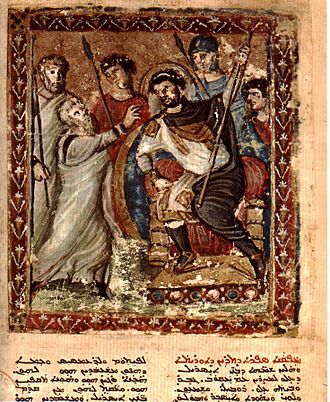 p. 23, 24. Deseret Book Company, Salt Lake City, 1997. ^ Haslam, Gerald M. (1999). "Scandinavian Emigration History and Sources". Genealogical journal. 27 (3–4): 100. ^ a b Hvidt, Kristian (1975). Flight to America; the social background of 300,000 Danish emigrants. New York: Academic Press. pp. 148–149, 154. ISBN 0-12-785348-0. Cite error: Invalid <ref> tag; name "Hvidt" defined multiple times with different content (see the help page). ^ "Lehi High School". Alpine School District. Retrieved 20 September 2012. ^ "Mormon Pioneer Overland Travel". The Church of Jesus Christ of Latter-day Saints. Retrieved 21 April 2015. Barney, Ronald O., editor. The Mormon Vanguard Brigade of 1847: Norton Jacob's Record. Utah State University Press, Logan, Utah 2005. ISBN 0-87421-609-5. Bennett, Richard E. We'll Find the Place: The Mormon Exodus 1846-1848. Deseret Book Company, Salt Lake City, Utah, 1997. ISBN 1-57345-286-6. Hafen, Leroy and Ann. "Handcarts to Zion". University of Nebraska Press, 1992. Madsen, Carol Cornwall. Journey to Zion: Voices from the Mormon Trail. Salt Lake City, Utah, Deseret Book, 1997. ISBN 1-57345-244-0. May, Dean L. Utah: A People's History. Bonneville Books, Salt Lake City, Utah, 1987. ISBN 0-87480-284-9. Slaughter, William and Landon, Michael. "Trail of Hope: The Story of the Mormon Trail". Deseret Book Company, Salt Lake City, 1997. Stegner, Wallace. "The Gathering of Zion". University of Nebraska Press, 1992. Walker, Ronald W. and Doris R. Dant, editors, "Nearly Everything Imaginable: the Everyday Life of Utah's Mormon Pioneers." BYU Studies, Provo, Utah 1999. American Westward Migration — online diaries scanned from original Mormon pioneers of the 1850s. Archive.org: Pioneers and Prominent Men of Utah — 1913 book by Frank Ellwood Esshom. The history of Nauvoo, Illinois starts with the Sauk and Fox tribes who frequented the area. 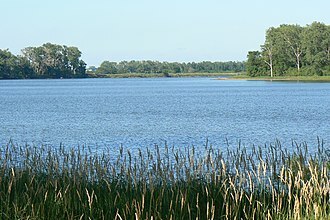 They first called the area Quashquema, named in honor of the Native American chief who headed a Sauk, permanent settlement by non-natives was reportedly begun in 1824 by Captain James White. 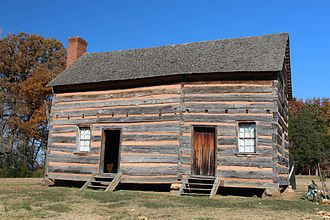 By 1827 other white settlers had built cabins in the area, by 1829 this area of Hancock County had grown sufficiently so that a post office was needed and in 1832 the town, now called Venus, was one of the contenders for the new county seat. However, the honor was awarded to a city, Carthage. In 1834 the name Venus was changed to Commerce because the settlers felt that the new name better suited their plans. In late 1839, arriving Mormons bought the town of Commerce and in April 1840 it was renamed Nauvoo by Joseph Smith. Nauvoo grew rapidly and for a few years was one of the most populous cities in Illinois, within two years of Joseph Smiths assassination in 1844, most of the population had departed, fleeing armed violence. Most headed west with the led by Brigham Young. In 1849 Icarians moved to the Nauvoo area to implement a utopian socialist commune, in the early and mid 20th century Nauvoo was primarily a Catholic town, and the majority of the population today is Catholic. Nauvoo today is an important tourist destination for Latter Day Saints and others who come to see the restored historical buildings. A large village of Sauk and Meskwaki lived along the Mississippi near what is Nauvoo, established in the late 18th century, in 1823 or 1824, Captain James White purchased the village from Quashquame, a Sauk leader. White gave Quashquame “a little sku-ti-apo, and two bushels of corn” for the land. Quashquames village moved to the west side of the river, merging with an existing Sauk village near what is now Montrose, in 1841, Joseph Smith, Jr. living in Nauvoo, was visited by Sauk and Meskwaki from the Iowa village. The ferryman brought over a number on the ferry-boat and two flat boats for the purpose of visiting me. A ford is a shallow place with good footing where a river or stream may be crossed by wading, or inside a vehicle getting its wheels wet. A ford is mostly a natural phenomenon, in contrast to a low water crossing, a ford is a much cheaper form of river crossing than a bridge, but it may become impassable after heavy rain or during flood conditions. A ford is therefore only suitable for very minor roads. Most modern fords are usually enough to be crossed by cars. In New Zealand, fords are a part of major roads, until 2010. As most inter-city domestic passengers travel by air and as much cargo goes by sea, long distance road traffic is low, in dry weather, drivers become aware of a ford by crunching across outwash detritus on the roadway. A Bailey bridge may be built off the line of the road to carry emergency traffic during high water. At places where the water is enough, but the material on the riverbed will not support heavy vehicles. In such cases a curb is often placed on the side to prevent vehicles slipping off. Brigham Young was an American leader in the Latter Day Saint movement and a settler of the Western United States. He was the second President of The Church of Jesus Christ of Latter-day Saints from 1847 until his death in 1877 and he founded Salt Lake City and he served as the first governor of the Utah Territory. Young led the foundings of the precursors to the University of Utah, Young was dubbed by his followers the Lion of the Lord for his bold personality and was commonly called Brother Brigham by Latter-day Saints. Young was a polygamist and was involved in controversies regarding black people and the Priesthood, the Utah War, and the Mountain Meadows massacre. Young was born to John Young and Abigail Nabby Howe, a family in Whitingham, Vermont. Young was first married in 1824 to Miriam Angeline Works, though he had converted to the Methodist faith in 1823, Young was drawn to Mormonism after reading the Book of Mormon shortly after its publication in 1830. He officially joined the new church in 1832 and traveled to Upper Canada as a missionary, after his wife died in 1832, Young joined many Mormons in establishing a community in Kirtland, Ohio. In 1844, while in jail awaiting trial for treason charges, Joseph Smith, several claimants to the role of church president emerged during the succession crisis that ensued. 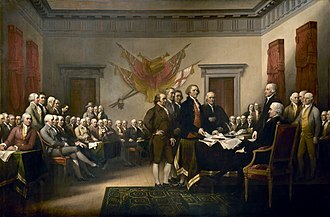 Young opposed this reasoning and motion, the majority in attendance were persuaded that the Quorum of the Twelve Apostles was to lead the church with Young as the Quorums president. Many of Youngs followers would reminisce that while Young spoke to the congregation, he looked or sounded exactly like Smith, Young was ordained President of the Church in December 1847, three and a half years after Smiths death. Rigdon became the president of a church organization based in Pittsburgh, Pennsylvania. Repeated conflict led Young to relocate his group of Latter-day Saints to the Salt Lake Valley, Young organized the journey that would take the Mormon pioneers to Winter Quarters, Nebraska, in 1846, to the Salt Lake Valley. By the time Young arrived at the destination, it had come under American control as a result of war with Mexico. Missouri is a state in the Midwestern region of the United States, achieving statehood in 1821. With over six million residents, it is the eighteenth most populous state, the largest urban areas are St. Louis, Kansas City and Columbia. The capitol is in Jefferson City on the Missouri River, the state is the twenty-first most extensive by area and is geographically diverse. 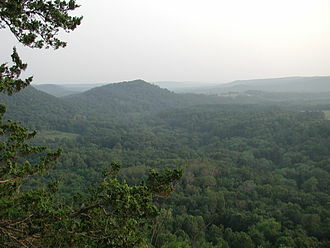 The Northern Plains were once covered by glaciers, tallgrass prairie, in the South are the Ozarks, a forested highland, providing timber and recreation. The Mississippi River forms the border of the state, eventually flowing into the swampy Missouri Bootheel. 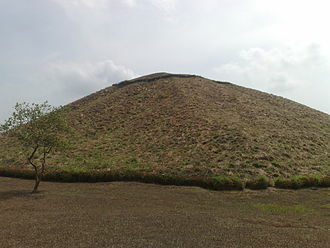 Humans have inhabited the land now known as Missouri for at least 12,000 years, the Mississippian culture built cities and mounds, before declining in the 1300s. 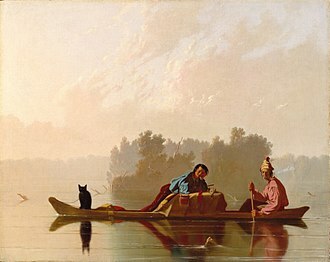 When European explorers arrived in the 1600s they encountered the Osage, the French established Louisiana, a part of New France, and founded Ste. Genevieve in 1735 and St. Louis in 1764, after a brief period of Spanish rule, the United States acquired the Louisiana Purchase in 1803. Americans from the Upland South, including enslaved African Americans, rushed into the new Missouri Territory, many from Virginia and Tennessee settled in the Boonslick area of Mid-Missouri. Soon after, heavy German immigration formed the Missouri Rhineland, Missouri played a central role in the westward expansion of the United States, as memorialized by the Gateway Arch. 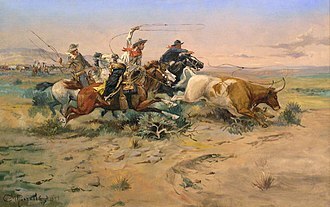 The Pony Express, Oregon Trail, Santa Fe Trail, as a border state, Missouris role in the American Civil War was complex and there were many conflicts within. After the war, both Greater St. Louis and the Kansas City metropolitan area became centers of industrialization and business, the state is divided into 114 counties and the independent city of St. Louis. Missouris culture blends elements from the Midwestern and Southern United States, the musical styles of ragtime, Kansas City jazz, and St. Louis Blues, developed in Missouri. The well-known Kansas City-style barbecue, and lesser known St. Louis-style barbecue can be found across the state, St. The Church of Jesus Christ of Latter-day Saints is a Christian restorationist church that is considered by its members to be the restoration of the original church founded by Jesus Christ. The church is headquartered in Salt Lake City and has established congregations, according to the church, it has over 70,000 missionaries and a membership of over 15 million. It is ranked by the National Council of Churches as the fourth-largest Christian denomination in the United States and it is the largest denomination in the Latter Day Saint movement founded by Joseph Smith during the period of religious revival known as the Second Great Awakening. 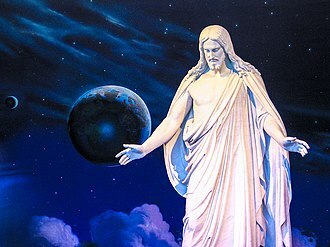 Adherents, often referred to as Latter-day Saints, or, less formally, view faith in Jesus Christ and his atonement as fundamental principles of their religion. The church has a canon which includes four scriptural texts, the Bible, the Book of Mormon, the Doctrine and Covenants. The current president is Thomas S. Monson, individual members of the church believe that they can receive personal revelation from God in conducting their lives. The president heads a hierarchical structure with various levels reaching down to local congregations, drawn from the laity, lead local congregations. Male members, after reaching age 12, may be ordained to the priesthood, Women do not hold positions within the priesthood, but do occupy leadership roles in some church auxiliary organizations. Both men and women may serve as missionaries, and the church maintains a large missionary program which proselytizes, faithful members adhere to church laws of sexual purity, health and Sabbath observance, and contribute ten percent of their income to the church in tithing. The LDS Church was formally organized by Joseph Smith on April 6,1830, Smith intended to establish the New Jerusalem in North America, called Zion. In 1831, the moved to Kirtland and began establishing an outpost in Jackson County, Missouri. However, in 1833, Missouri settlers brutally expelled the Latter Day Saints from Jackson County, the Kirtland era ended in 1838, after a financial scandal rocked the church and caused widespread defections. The Platte River /plæt/ is a major river in the state of Nebraska and is about 310 mi long. Measured to its farthest source via its tributary the North Platte River, the Platte River is a tributary of the Missouri River, which itself is a tributary of the Mississippi River which flows to the Gulf of Mexico. The Platte over most of its length is a muddy, shallow, meandering stream with a swampy bottom and these characteristics made it too difficult for canoe travel, and it was never used as a major navigation route by European-American trappers or explorers. This expression is very close to the French words rivière plate, in central north Colorado is the North Park valley, ringed by mountains of 12,000 feet height, this is where the North Platte River originates. The nearest Colorado town is Walden, the county seat, the rugged Rocky Mountains Continental Divide surrounding Jackson County have at least twelve peaks over 11,000 feet in height. From Jackson County, the North Platte flows north about 200 miles out of the Routt National Forest and North Park near what is now Walden to Casper, Wyoming. Shortly after passing Casper, the North Platte turns to the east-southeast and flows about 350 miles to the city of North Platte, Nebraska. In Colorado and Wyoming, the North Platte is narrower and much swifter flowing than it is in Nebraska, the North Platte River has been dammed about eight times for water storage and irrigation purposes in Wyoming and Nebraska as it flows to its confluence with the South Platte River. The upper reaches of the river in the Rockies in Colorado and Wyoming are popular for rafting and lure and fly fishing for rainbow, cutthroat trout. In western Nebraska, the banks and riverbed of the North Platte provide a green oasis amid an otherwise semi-arid region of North America, today, by the time the North Platte reaches Paxton, Nebraska it is much smaller due to the extensive water taken from it for irrigation. Historically, the North Platte River was up to a mile wide in places, as evidenced by the old streambed. The South Platte drains a part of the Front Range mountains east of the continental divide. Nauvoo is a small city in Hancock County, United States, on the Mississippi River near Fort Madison, Iowa. The population of Nauvoo was 1,149 at the 2010 census, the city and its immediate surrounding area are listed on the National Register of Historic Places as the Nauvoo Historic District. The area of Nauvoo was first called Quashquema, named in honor of the Native American chief who headed a Sauk, by 1827, white settlers had built cabins in the area. By 1829 this area of Hancock County had grown sufficiently so that a post office was needed and in 1832 the town, the honor was awarded to a nearby city, Carthage. In 1834 the name Venus was changed to Commerce because the settlers felt that the new name better suited their plans, the name Nauvoo is derived from the traditional Hebrew language with an anglicized spelling. The word comes from Isaiah 52,7, “How beautiful upon the mountains. ”It is notable that “by 1844 Nauvoos population had swollen to 12,000, after Joseph Smiths death in 1844, continuing violence from surrounding non-Mormons forced most Latter-Day Saints to leave Nauvoo. 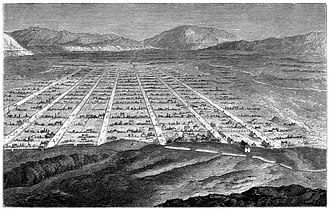 Most of these refugees, led by Brigham Young, eventually emigrated to the Great Salt Lake Valley, in 1849, Icarians moved to the Nauvoo area to implement a utopian socialist commune based on the ideals of French philosopher Étienne Cabet. At its peak the colony numbered over 500 members, but Cabets death in 1856 caused some members to leave this parent colony, in the early and mid 20th century Nauvoo was primarily a Roman Catholic town, and the majority of the population today is Catholic. Guided tours are available at the churchs Joseph Smith Historic Site, located at the end of the town. The LDS Church owns most of the historic sites in Nauvoo, including the homes of Brigham Young. Kimball, and other members of the church, as well as other significant buildings. Most of these sites are open to the public, with demonstrations and displays and these tours are free, as are the stage and riverside theatrical productions. There is a visitors center complete with two theaters and a relief map of 1846 Nauvoo. James Knox Polk was the 11th President of the United States. Polk was born in Pineville, North Carolina, and moved to Tennessee to study law, after building a successful law practice, he was elected to the Tennessee legislature and to the United States House of Representatives in 1825. He left Congress to serve as Governor of Tennessee from 1839 to 1841, after losing re-election as governor in 1840, and losing in another gubernatorial election in 1842, Polk was a dark horse candidate for president in 1844. Though he entered the convention hoping to be nominated for vice president, in the general election, he defeated Henry Clay of the rival Whig Party in large part due to his promise to annex the Republic of Texas. True to his pledge to serve only one term as President, Polk left office in March 1849. He died of cholera three months later, scholars have ranked him favorably on lists of greatest presidents for his ability to promote, obtain support for, and achieve all of the major items on his presidential agenda. However, he has criticized for leading the country into war against Mexico. Polk has been called the least known consequential president, James Knox Polk, the first of ten children, was born on November 2,1795 in a log house in what is now Pineville, North Carolina in Mecklenburg County, just outside Charlotte. His father, Samuel Polk, was a slaveholder, successful farmer and his mother, Jane Polk, was a descendant of a brother of the Scottish religious reformer John Knox. She named her firstborn after her father James Knox, like many early Scots-Irish settlers in the North Carolina mountains, the Knox and Polk families were Presbyterian. While Polks mother Jane remained a devout Presbyterian her entire life, when the parents took the young James to a Presbyterian church to be baptized, the father Samuel refused to declare his belief in Christianity, and the minister refused to baptize the child. In 1803, most of Polks relatives moved to the Duck River area in what is now Maury County, Middle Tennessee, the family grew prosperous, with Samuel Polk turning to land speculation and becoming a county judge. 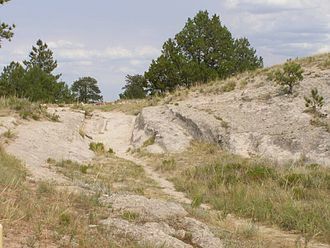 The Oregon Trail is a 2, 170-mile historic east–west, large-wheeled wagon route and emigrant trail that connected the Missouri River to valleys in Oregon. 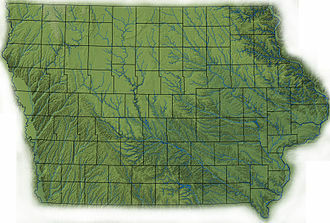 The eastern part of the Oregon Trail spanned part of the state of Kansas. The western half of the trail spanned most of the states of Idaho. The Oregon Trail was laid by fur traders and traders from about 1811 to 1840, by 1836, when the first migrant wagon train was organized in Independence, Missouri, a wagon trail had been cleared to Fort Hall, Idaho. From the early to mid-1830s the Oregon Trail and its offshoots were used by about 400,000 settlers, miners, ranchers. The eastern half of the trail was used by travelers on the California Trail, Mormon Trail. Use of the trail declined as the first transcontinental railroad was completed in 1869, making the trip west substantially faster and safer. Today, modern highways, such as Interstate 80 and Interstate 84, follow parts of the same course westward and pass through towns originally established to serve those using the Oregon Trail. Although Lewis and William Clark found a path to the Pacific Ocean, it was not until 1859 that a direct and practicable route, the first land route across what is now the United States was mapped by the Lewis and Clark Expedition between 1804 and 1806. On the return trip in 1806 they traveled from the Columbia River to the Snake River and they traveled overland up the Blackfoot River and crossed the Continental Divide at Lewis and Clark Pass and on to the head of the Missouri River. This was ultimately a shorter and faster route than the one they followed west and this route had the disadvantages of being much too rough for wagons and controlled by the Blackfoot Indians. They did show the way for the men, who within a decade would find a better way across. Founded by John Jacob Astor as a subsidiary of his American Fur Company in 1810, two movements of PFC employees were planned by Astor, one detachment to be sent to the Columbia River by the Tonquin and the other overland under an expedition led by Wilson Price Hunt. 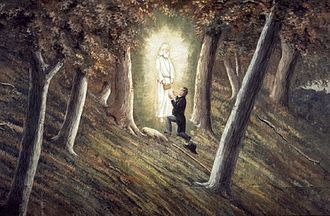 Smith said he received golden plates from the angel Moroni at the Hill Cumorah. 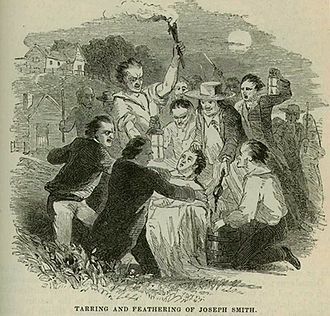 A mob tarred and feathered Smith in 1832. Smith dedicated the Kirtland Temple in 1836. The door in Carthage Jail through which the mob fired. There is a bullet hole in the door. The five sons of John and Nabby Young From left to right: Lorenzo Dow, Brigham, Phineas H., Joseph, and John. 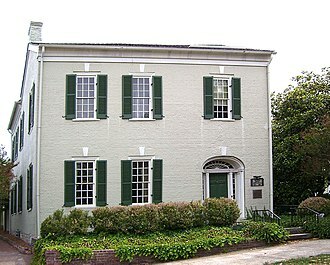 The house where Polk spent his young adult life before his presidency, in Columbia, Tennessee, is his only private residence still standing. It is now known as the James K. Polk Home. Polk and his cabinet in the White House dining room, 1846. 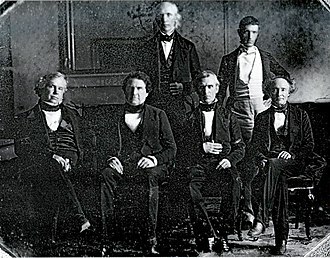 Front row, left to right: John Y. Mason, William L. Marcy, James K. Polk, Robert J. Walker. Back row, left to right: Cave Johnson, George Bancroft. Secretary of State James Buchanan is absent. This was the first photograph taken in the White House, and the first of a presidential Cabinet. Trap nets used to trap birds (tacuinum sanitatis casanatensis); 14th century. Size comparison between two common types of spring traps: rat trap (above), and the smaller mouse trap (below).